Despite the chilly breeze and overcast skies, I can’t help but see the promise of summer everywhere. At Seastar Restaurant, I’ve been watching the glow of the sunset linger just a little longer each night, reflecting lilac and copper and gold across the downtown skyscrapers. Daffodils have sprung up beside every mailbox and lamppost. Cherry blossoms have burgeoned forth all across our neighborhoods, veiling the trees in the faintest blush-pink lace. Sometimes light breaks through the midafternoon clouds, diffusing through the classroom windows between spurts of rain, and I lean my head on my hand and dream of sunshine. My urgency for summer began sometime in late January. Frost no longer edged the tips of our front lawn in the mornings the way it had all winter. One day I saw that the grass had grown thick and lush, the kind of grass that makes you think of summer camp and daisy chains and tie dyed tank tops. It was the kind of grass that makes you want to do cartwheels, just for that brief moment when your fingertips pass through that soft fringe of green. It made me want to make ice cream. It was still too cold to legitimately make a frozen dessert, so I waited all through January and February. And although earlier this week the sky dropped a few forlorn flakes of snow, I couldn’t hold back any longer. I wanted ice cream, real ice cream that didn’t skimp on the cream and positively melted on your spoon between leaving the freezer and reaching your tongue. Besides the freedom and the yellow plastic sunglasses and the short-sleeved walks into the evening, what I am looking forward to most about summer is the fruit. Peaches bursting out of their soft skins, handfuls and handfuls of glossy cherries, the hollow sound when you make the first cut through a watermelon. But with nothing but citrus really in season, I tried to think of another flavor that would satisfy. I’ll be honest and tell you that I have never been a vanilla fan. A steadfast chocoholic, I don’t think I ever bought vanilla ice cream or asked for white cake. It’s only been recently that I’ve begun to see vanilla as something special. I have a stash of Nielsen-Massey vanilla, beans and extracts that I only save for the most classic and important desserts where it will “really count,” and I thought vanilla ice cream was the perfect way to make the beans shine. After two months of waiting, I couldn’t do it any longer. At 10 PM on a school night I turned on all the lights down the hallway to the kitchen and started to make the ice cream base. 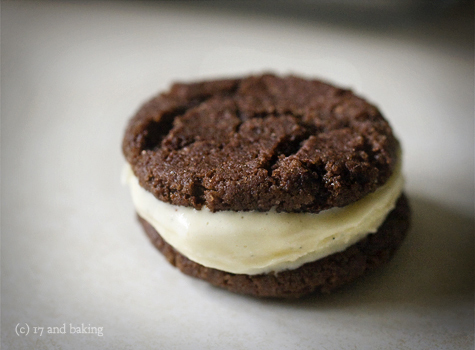 I picked a David Lebovitz recipe – there is nobody I trust more with ice cream – which was straightforward and simple enough. As I scraped the vanilla bean with my knife, the tiny seeds collecting like glittery black jewels, the smell of vanilla drifted into my clothes. I didn’t waste a single seed, and the custard came together beautifully. Before putting it in the refrigerator to chill overnight, I tried a spoonful. Although the ice cream hadn’t been churned and was essentially soup, I was immediately floored. I had never had vanilla so intense, creamy and floral, somehow exotic. How could I have ever thought vanilla plain? The next morning I was in the kitchen to pour myself a bowl of cereal when I decided I couldn’t wait until after school to finish. I poured the chilled ice cream custard into the ice cream maker to churn while I showered and got dressed. The custard had been good enough to drink, but after it was churned? It had the consistency of soft-serve, not yet firmed up, but it was so incredible. I even beckoned my friend C-, who I carpool with, into my house so that he could try a spoonful for himself before we rushed to first period. Even though my favorite ice cream flavor has been basil since I first made it two summers ago, I need to tell you all that this is without a doubt the best ice cream I’ve ever made. It might even be the best ice cream I’ve ever tried at all. 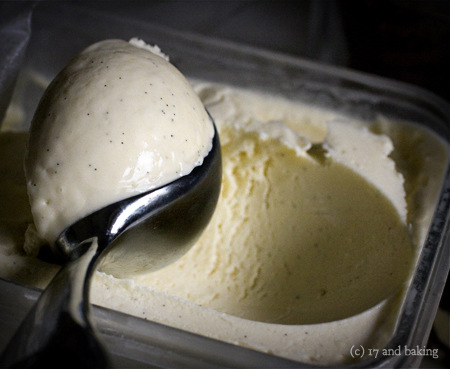 It’s unbelievably thick and creamy, smooth as marble and speckled with constellations of vanilla bean seeds. It has the texture of frozen custard – somehow “ice cream” doesn’t convey how soft and rich and gorgeous this ice cream is. If that weren’t enough, the vanilla itself seems to fill the inside of your mouth like a perfume, not just in the ice cream but in the very air around it. This ice cream will convert a chocoholic into a person who dreams in vanilla. Wanting to give you more than just ice cream, I also baked some raspberry cocoa cookies that I’ve made a few times now. They’re little, gone in two bites, chewy in the center and crisp-edged. 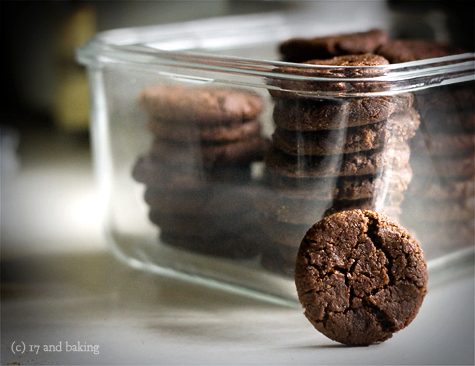 Made with a half cup of jam, they taste like thin brownie-cookies topped with raspberries. 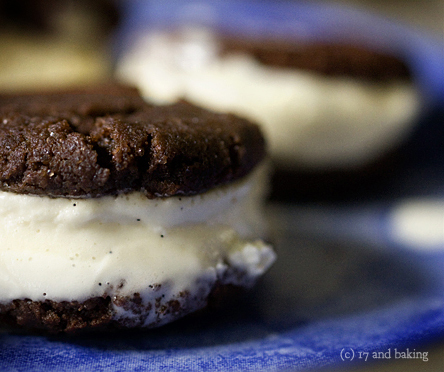 Ever since the first time I made them, I knew they would make a good ice cream sandwich. 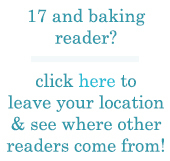 [On non-food related note, I feel the need to mention the new “(c) 17 and baking” text appearing on this week’s photos. I hate having to put watermarks on my photos. I think it’s ugly and distracting. I think food photography should be about food and the way food makes you feel, and the text seems so awkward. But my photos have been stolen and used without my permission twice in the last month, and I have reluctantly concluded that a watermark might reduce theft. These cookies are really simple and really pretty good. I can’t be all glowy about them when there’s still ice cream in the freezer, but they are definitely delicious and open to a lot of variation (coffee, cinnamon, chili powder, anyone?) Plus, they don’t have butter or eggs, so I think they can easily be made vegan or gluten free. 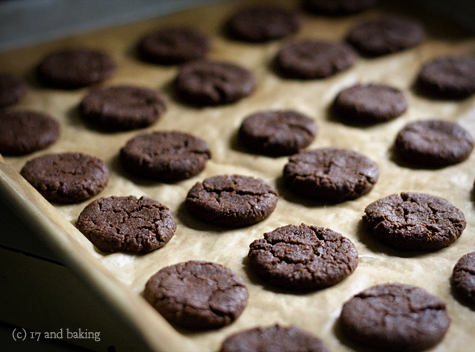 After the 10 minute baking time, they won’t seem done at all, but if you let them cool they will firm up a lot. Otherwise, if you overbake them, they’ll still be delicious, just crunchy. I’d suggest you try baking a couple cookies to begin with to find the perfect baking time for you and your oven. If you end up with overly-crunchy cookies, store them in an airtight container with a slice of bread and the cookies will soften. I feel like I’ve said everything there is to say about this ice cream. It is perfection. Preheat the oven to 350 degrees F. Sift together the sugar, cocoa powder, flour, baking soda, and salt, then stir in the jam, oil, and extracts. Flatten into walnut-sized balls on greased cookie sheets and bake for 10 minutes. Heat the milk, salt, and sugar in a medium saucepan. (I waited until I saw the liquid steaming.) Scrape out the seeds of the vanilla bean with a paring knife and add to the milk, along with the bean pod. Cover, remove from heat, and let infuse for an hour. Set up an ice bath by placing a 2 quart bowl inside a large bowl partially filled with water and ice. Put a strainer on top of the smaller bowl and pour in the cream. In another bowl, stir the egg yolks together. Reheat the milk until warmed, then gradually pour some hot milk into the yolks, constantly whisking to keep the eggs from scrambling. Once the yolks are warmed, scrape the yolks and milk back into the saucepan and cook over low heat. Stir constantly and scrape the bottom with a spatula until the mixture thickens into a custard that coats the back of the spatula. Strain the custard into the heavy cream and stir the mixture until cooled. Add the vanilla extract and refrigerate until thoroughly chilled, preferably overnight. 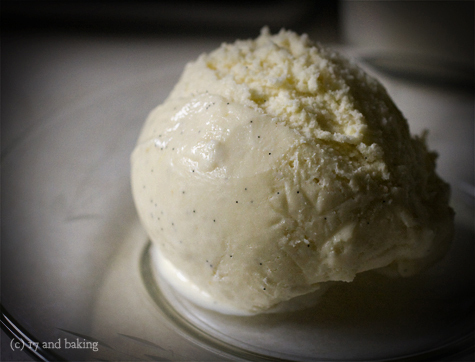 Remove the vanilla bean and freeze in an ice cream maker. 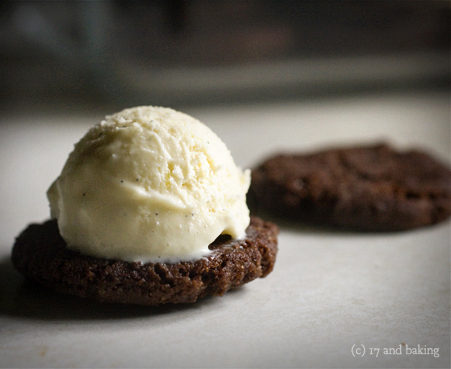 Entry filed under: Cookies, Frozen Desserts. Tags: berries, chocolate, Cookies, creamy, frozen, ice cream, raspberries, vanilla. You make me want to grab a spoon and poke it through the screen. 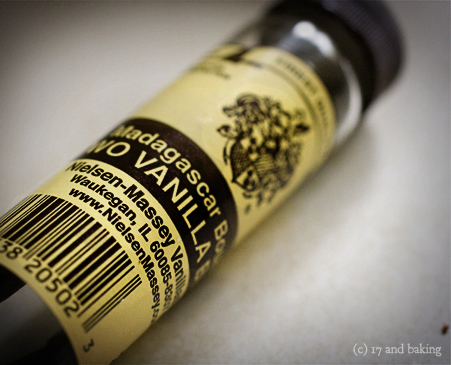 I just love using real vanilla – makes everything better, doesn’t it? i made you’re chocolate crinkle cookies and they turned out great!! they were sooo yumm! gosh elissa, these look AMAZING. simply, truly, delectable. ive been making ice cream manually and i think i might need a machine soon. Do you order your vanilla beans online? I cant wait to take my ice cream maker out again and try this…the sun is shining finally. I love the combo of chocolate and raspberry. Elissa, I’m in. . . awe. I finally got my ice cream maker, and I finally made this ice cream. And it is the best ice cream I have ever tasted. You are absolutely right, it would convert a chocoholic any day. Love this blog and the recipes here! And the photos are gorgeous, it’s so awful that there are people out there who decide to just take. Damn. I have been wanting to make these cookies for so long, but when I did they wound up a hot mess. I must have missed something, because these were, quite possibly, the worst cookies I have ever tasted. Yikes… Flour Child, so sorry they didn’t work! I’ve made the cookies twice and they turned out great both times, like chewy and crisp raspberry brownie bites. I don’t know if this’ll help at all, but you can soften hard cookies by putting them in a container with a slice of bread. So, I made this recipe again. With sugar this time. It was really good. And really excellent with lemon ice cream, as ice cream sandwiches. I love your site, I just discovered it a few months ago and regularly look through your recipes when i feel like baking something new. 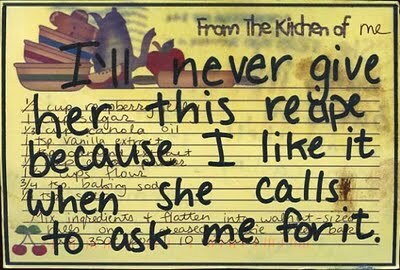 I myself am 20 years old and baking, but I started about the same time you did. I love your recipes, and this was no different, although I thought the cookies went a little overboard on the almond extract. Thank you for doing this blog, you’re a beautiful photographer, and somehow, an even better writer. Those cookies look beautiful – I’m planning to bake some for my class. I’m just wondering though, is it possible to freeze/refrigerate the dough overnight/for a few days? Because I want to bake them fresh in the morning before class. I just made these cookies, and they were the best I’ve ever made! I didn’t touch on the ice cream because I don’t eat dairy, but I’m sure it would be amazing. I didn’t have the almond extract and didn’t feel like a trip to the store, so I made them without it. Another change I made was adding chocolate chips. Without the ice cream in the middle, I thought they’d need something extra for texture. I had to add a little extra oil and jam; I think it was the chocolate chips. These were staggeringly easy to make and came out soooo gooey and tasty! I hate potlucks, but I want to get invited to one now just so i can bring these. Τhis blοg wɑs… how do I say it? Relevant!! Finally I’ve found sometɦing which helped me.